Many things have happened since we last wrote including the improvement of our health!!!! We both are feeling much better. Our main event was starting Spanish lessons for four hours each morning. Classes are one on one, and there are about 15 other students in the us. My teacher patient teacher is Rebecca, a young woman that is going to college at night and teaching me during the day. Andy’s teacher is Rosa Maria, she has been teaching for 13 years. I have figured out that I hardly remember anything from high school Spanish class and have had to start over. Hopefully by the end of our trip I will be able to have a real conversation with the locals. After classes we have opportunities to attend Spanish movies, visit local places like a Macadamia Nut plantation, and we even have homework to do! On Tuesday we met the volunteer coordinators, Kristen and Emily. While on a trip to a school, Pedro Molina, using the local b us transport called “chicken buses” – Old, loud, and brightly colored US school buses which drive super faster and crazy like – The school used to be a military base, but now is a school of 1000 students. The library needs a lot of help. It has many books, but many of them are very old and falling apart and many are just outdated. There is no record or inventory for the books so my job will be to create and inventory all the information about the book into a computer so that Probigua has some sort of record of what they have so they can see what the library needs. Emily and Kristen informed me that any work that I achieve in this library will help since there is so much that needs to be done. The computer center wasn’t up and running or else Andy would have checked it out. We are returning to Pedro Molina tomorrow so maybe he will get a chance then. On Friday night we went out for a drink with Nadya to the only Irish bar in Antigua, Reillys. Andy ordered what looked like a wine cooler type drink, but ended up with a beer that tastes similar to bud light. The atmosphere at Reillys was pretty much the same as home with the rapper 50 cent playing loudly. On Sunday we climbed our first active volcano!!!! After a morning of homework a shuttle picked us up at our favorite internet place and took us to the trailhead of Vulcan Pacaya. On the way we met other people our age from Arizona and Canada. Once we stepped out of the shuttle our guide put us in a group called Pacaya and we started our climb to the active lava of the volcano. The trail was steep at first and really dusty. Once we were out of the trees we started seeing and walking on lava rocks that had been there for 5 months. As we kept going we saw smoke and lava on the volcano and the lava rocks that we were walking on started getting warm. The wind was cold, but the heat from the rocks was keeping us warm. 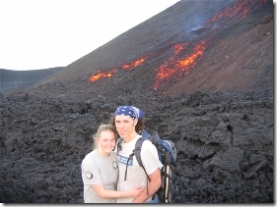 We stayed close to our guide until we saw flowing lava coming down the side of the volcano!!! !